ww2dbaseThe Karabiner 98 Kurz bolt-action rifles, also known as Kar98k or K98k, became the standard German infantry rifles in 1935. Although the name of these rifles contained the word carbine, they were in fact rifles. They were considered bulky and heavy compared to contemporary rifles, while the bolt-action might mean a slower firing rate; however, German soldiers reported that these rifles were preferred for their high accuracy. This notion changed later in the European War as they became overpowered by semi-automatic weapons wielded by Russian and American troops. Most snipers of the German Army were equipped with the sniper rifle versions of this design, which were equipped with Zeiss Zielvier 4x (ZF39), Zeiss Zielsechs 6x (ZF42), Ajack 4x, Hensoldt Dialytan 4x, or Kahles Heliavier 4x telescopic sights. In late 1944, the Kriegsmodell variant was introduced with simplified design to increase production; these rifles lacked the bayonet lug, cleaning rod, stock stick, and other features found in the prior Kar98k rifles. Between 1935 and 1945, about 14,000,000 Kar98k rifles of all variants were built; 132,000 of which were sniper rifles. During the war, Russian and other Soviet troops captured several million Karabiner 98k Kurz rifles of all variants. They were initially stored away in warehouses and factories in preparation for the potential escalation of the Cold War, but eventually they were shipped to communist revolutionary groups around the world, such as in the case of the communist forces during the Vietnam War. Some of the formerly occupied nations such as Norway and Romania also captured large stocks of Kar98k rifles as Germany surrendered in 1945, and used them as standard rifles in their military forces. Karabiner 98k Kurz rifles continued to be built after WW2 by firms such as Fabrique Nationale of Belgium and ?eská Zbrojovk of Czechoslovakia; many of the Czech-built rifles went to Israel, which were used, alongside other models of rifles, as standard rifles until the 1970s, seeing action in the Six-Day War in 1967 and the Arab-Israeli War in 1973. During the 1990s, many Kar98k rifles were seen during the conflict in Yugoslavia. 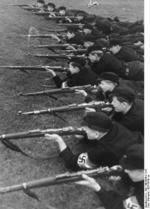 Today, the Germany Army maintains a small stock of these rifles for military parades; there were also reports of Kar98k rifles being used in action against American and British forces in Iraq. Mauser rifles are better that Mosins.. but I fancy the Mosin more.. why is this ?? The German Mauser bayonet Model 98/22 was based upon the design produced originally for the Model 1898 Mauser rifle, and of which bayonet pattern there were innumerable variations manufactured during World War One. 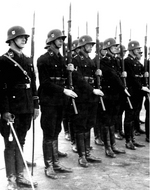 A new bayonet design was introduced in c.1922 and remained in service right up until the end of World War Two. Several variations existed, some having wooden grips, others with reddish-brown coloured synthetic material (bakerlite?) grips. The blade was 26cm long and the bayonet's fittings were often of blued steel. hy! y am from Romania and y whant to buy an full operatinal k98k, but y can't find one in my country. can someone help me?? ?